Mojito? No, Moschito! 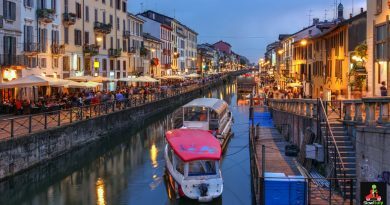 New Grappa-based cocktails popping up in Italy. Moschito is among the many new grappa-based cocktails appearing on the Italian cocktail scene. Grappa is a traditional grape-based brandy (acquavite) made by distilling the vinaccia (pomace): the skins, pulp, seeds and stems left over from wine-making after pressing the grapes. The distillate has an alcohol content of 35%-60% alcohol by volume, or 70 to 120 proof. Only grappa made in Italy from wine-making residue can rightfully be called ‘grappa‘. The Scuola Medica Salernitana, followed by the physician and philosopher Taddeo Alderotti, were the first to codify the distillation process of aqua vitae and its use as a therapeutic beverage in the 12th and 13th century. 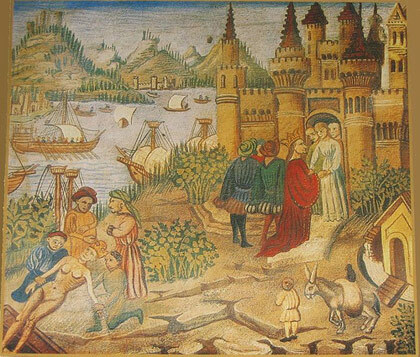 In one of his books, written around 1265, Alderotti listed a long list of evils that aqua vitae would allegedly cure. He also explained that the drink distilled from medicinal species and herbs would have the same curative and active properties. 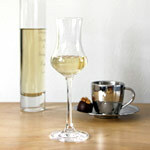 Still today, many Italians consume grappa as a digestivo after (heavy) meals to aid digestion. Until the 19C the term ‘grappa’ was mainly used generically to refer to a distillation product made from wine-making residue, but each region had its own denomination to refer to its own regional grappa. Paternity for the invention of grappa is a dispute that has not yet been settled. Possible links with the word Branda trace it back to Piedmont, while other sources say it was invented in Friuli. The word “grappa” in its current form and meaning occurs for the first time in a written source in a 1896 bilingual dictionary (Italian – Vicentine, the dialect of Vicenza) by Luigi Pajello. While its current and commonly accepted spelling is with a double « p », some historians say it should be written with only one « p » as its original spelling in the dialects of Northern Italy, where grappa was born, was with only one « p ». What started as a poor-man’s, rural product, snubbed by the well-to-do, slowly became mainstream in the ’70s. Different types of ‘mone-vines’ grappa appeared on the market made of only one type of high-end grapes, conferring the distillate a specific aroma and unique bouquet. 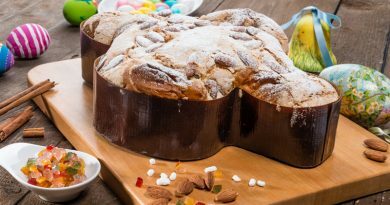 Apart from the young grappa, torbata (smoked), barricata (aged in barrique), and speciale (aromatic or aromatized) grappe started appearing on the market. Grappa mixes well with chocolate, honey, mint and milk, reason why many grappa cocktails include either mint or cocoa liquor. A tasty coffee-based drink is Grappacino, a strong espresso (ristretto) with Grappa, Amaretto and sugar syrup in a 5:1:1 proportion. Grappa added to the last drops of espresso left in a cup, is called a resentin in the Veneto region, swirled and drunk down in one sip. 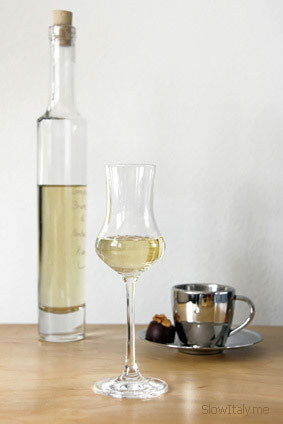 In recent years, grappa gained the status of a hip drink, served in the most trendy restaurants and clubs, straight or as a base for cocktails, such as Grappatini (a Grappa-Martini mix). 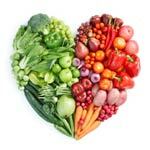 Recent studies show that 33% of the once homely drink is now consumed away from home, in restaurants and clubs. 29% of the consumers are also younger than 35. The product’s image is not only younger and trendier, but also more feminine, as women make up 32% of the grappa consumers. A young grappa is best consumed chilled at around 10 to 15° C, while an aged grappa is best served at ‘room temperature’, i.e. 18° C.
The perfect glass to taste grappa is a small tulipano glass with narrow opening, allowing the distillate to release its aromas and give off scents, then concentrating them in the upper part of the glass and guiding them onto the nose. Grappa is tasted in tiny sips, diluting the liquid with a little saliva, while calmly pressing it against the palate in order to allow for the aromas to be released. Good quality grappa is never harsh on the palate and should leave a long and pleasant aftertaste and a generous feeling of warmth. Many grappa counterfeits have appeared on the market in recent years, trying to surf on the wave of success. The name Grappa and the 136 grappa distilleries in Italy are now protected by the European regulation CE 110/08 and the Italian decree 297/97 stating that only Italian brandy made from Italian marc from grapes produced and distilled in Italy can be called grappa. Nine regions and areas have been given the Protected Geographical Status or Indicazione Geografica Tipica (IGT), each with their specific characteristics, in terms of flavors and scents reflecting the uniqueness of their territory of origin. These 9 IGT designations belong to six regions traditionally renowned for their artisan Grappa: Piedmont, Lombardy, Veneto, Trentino/Alto Adige, South Tyrol and Friuli Venezia Giulia, as well as the Barolo. Gently crush a handful of mint leaves and add a spoonful of lime juice in a cool tall glass. Pour sweet syrup or a dose of sugar and fill the glass with ice. 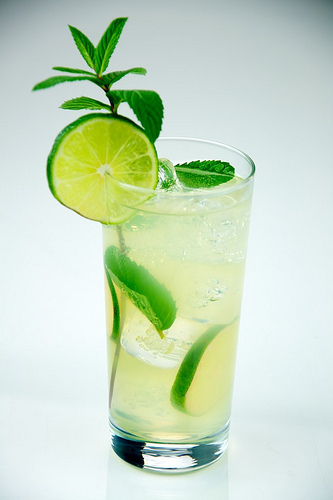 Add soda and grappa (instead of rum), garnish with a lime wedge and a few springs of mint and there is your Moschito.